I had a wonderful experience with Custom Earth Promos - great Customer Service! (Thank you Melanie) The RB17 looks great as well as our logo. I really like the sturdy, woven bag. It would be nice if the handles were longer and the plastic inserts were available, but that doesn't stop this bag and Custom Earth Promos from getting a five star rating! We hand these out to all women who support our nonprofit. The recycled reusable bag is such an important tool in the fight to change our irresponsible lifestyles as modern humans. Custom earth promos makes tons of really cool, functional, eco-friendly products. I suggest using them, you wont be let down. I had a wonderful experience with Custom Earth Promos! (Thank you Melanie) The RB17 looks great and our logo is perfect. I like that it is a woven bag. I would prefer the handles to be a little longer and the plastic inserts to be available, however that does not stop me from giving the bag and Custom Earth Promos 5 stars! Bag looks nice. Need to have bigger handles. Nice bags, we love the durability and versatility of them. I love the customer service I get from custom earth promos. I advise using custom earth promos. We selected the green and white colors. We really wanted to make a "green eco friendly" statement to the public so what better color then green to select. The reusable bags looked great and we were some satisfied customers. I love my bags so much! It will be impossible to miss our logo now! Five stars for this sleek bag! My customers love their bags and I'm certain my company's logo will be prominently displayed wherever they go. 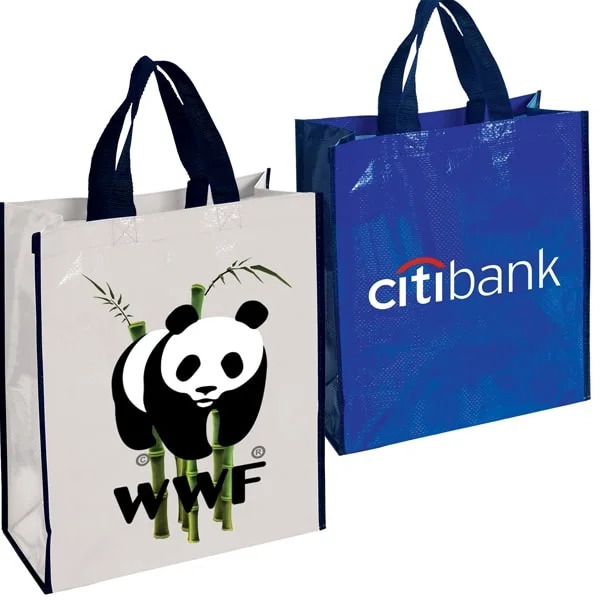 Custom Earth Promos is a good company to use for your reusable bags. The RB17 is the bag we selected because of the size. It fits our product well and we actually use the bag for packaging. They have lots of options and are more than useful on the phone to help narrow your search down or personalize to your demands. I love the classic look of our bags! The advertising potential is endless now! My clients love these bags! We will have to be ordering more soon! Our bags are perfect! They are comfortable while carrying heavier items and look absolutely amazing! Really impressed! My bags are lightweight but still sturdy. Plus our logo looks beautiful! Extremely high functioning bag. It easily carries the bigger items in my store without tearing. Definitely ordering more soon. Our bags surpassed our expectations! Thrilled with how they turned out. Good size bag, can be cleaned easily and is very affordable. We handed these out at Neo-Con in Chicago to promote our latest products. The reusable bag was such a good idea, we saw tons of people in our industry using our bags (even competitors!!). Custom Earth Promos is a great company to partner with on your reusable bag project, I suggest using them. I work for a large food retail store and I am in charge of what vendors we use at our store. We stopped the use of the plastic grocery bags last year. We have been using the RB17 and the PP4 bag as our standard options for reusable bags. Both are great bags the customers love them and use them for more than just groceries. The cashiers love them because they're durable, the RB17 stands on its own so its easy to load, and everyone wins because it is good for the environment. I would recommend the RB17. I like this bag, it was easy to design, the website is very easy to use and place an order. Its hard to give a 5 star rating with out seeing the finished product just yet. It was very easy working with there custom graphics department. I sent them a couple of images and graphics, they edited them in the way we asked and submitted a sample we had some back and forth and arrived at the perfect graphic for our bag. The bag came out exactly as designed, the physical printed graphic on the bag looks great. I would definitely use custom earth promos again. Our employees love this bag we ordered it last year for our holiday party as a giveaway. I would say at least 85% of them use the bag everyday or at least once a week for commuting, lunch, at home family tasks, there is so many uses. The bag has held up and I have not heard any bad stories about the bag. This year we decided to place another order just with a different newly designed company graphic. Looking forward to the finished product!! Love the woven polypropylene material!! Well made reusable bag, made from recycled materials. We liked how our graphic image printed on the bag so we decided to use this to package kids beach toys and sell it all as one package. The bag lives on and on and gets used for a variety of different uses and gets us free advertising. This was one of the best moves we made because I constantly get business from people saying they have seen our reusable bags. Love this website, very easy to get a quote and place an order. Great team to work with. We always use them for our reusable bags and promotional items. Great choice for a recycled reusable bag. You will be happy, and so will your customers. We really personalized this reusable bag, custom earth promos was a tremendous help through the whole process. I give them a 5 star review. I work for a large Italian market and we use reusable bags as our packaging and shopping bag. The customers love that we are making a difference for the environment. Plus the bags look great, they are so much more presentable and more professional looking then the old plastic bags that just get thrown out. This reusable bag is our favorite from custom earth promos. We use it as a giveaway to all customers who buy a membership, Its durable your company logo will look great on the laminated surface. I would recommend the RB17. I like the feel of the woven polypropylene material. It is very durable and the print quality is excellent. Customer care and management is excellent. I recommend CEP. Great to order in bulk. Prices are affordable and they have always been on time when stated. What's better than a standard tote bag? The incredibly eco-friendly Recycled Tote Bag from Custom Earth Promos continues to impress customers with its functionality and good looks. Whatever industry you’re in, from travel to hospitality to healthcare, you can rely on our reusable totes as great giveaway gifts for your target audience. Custom Earth Promos is proud to manufacture wholesale Recycled Woven Tote Bags that will have your customers coming back asking for more. Our totes are indispensable utility items that are perfect for a wide variety of uses in our daily lives. 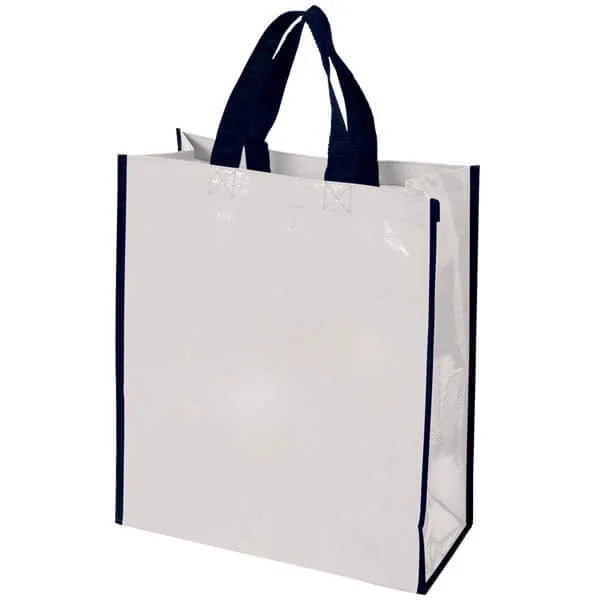 Think about your customers carrying aesthetic custom-made totes covered with your brand logo or company name. They can use these bags over and over again and feel good about the fact that they’re environmentally friendly. 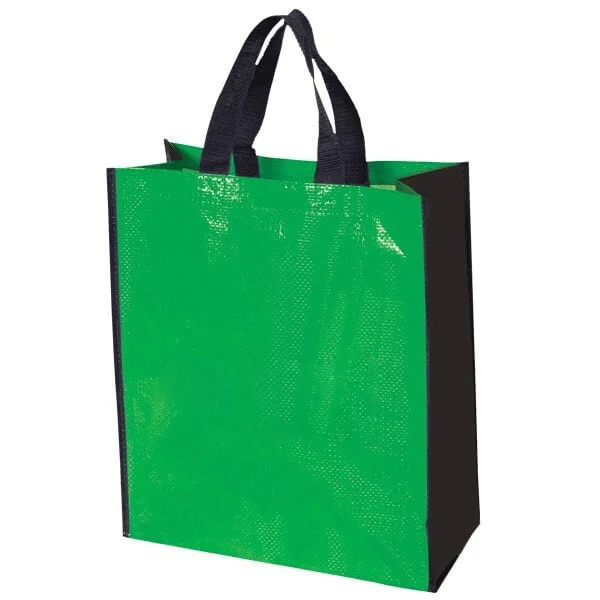 If you’re looking for a creative, thoughtful promotional giveaway, our eco-conscious totes are exactly what you need! Few bags give you as many features as you’ll find with our Recycled Woven Tote Bags. Plus you can custom order this specialty item to reflect your unique brand identity to perfection. Our aesthetically pleasing recyclable totes are made completely from recycled laminated materials. They’re incredibly strong, lightweight and tear-resistant, so they will serve your customers well on all of their shopping trips. Plus everyone can be happy knowing they’re doing their bit for Mother Earth. The extra-large gusset on these totes allows you to more easily carry bigger items in an already-generous compartment. And you have your choice of gusset color—navy-blue gussets complement the dark-blue tones of the bag surface, while the combination of the green bag with black gussets also makes for an eye-catching combo. Plus the carry handles have a webbed design to allow for easy hauling. Custom Earth Promos' eco-conscious tote bags are manufactured in a tightly monitored and quality-controlled factory. This means every tote that comes off our production line is crafted to perfection, with uniformity in texture, appearance and thickness. Each bag also complies with state safety standards. We manufacture all of our products in line with your design specifications—all at wholesale prices. We use our superior direct screen printing process to attractively etch your logo or promotional message into a highly visible 8" W x 8" H space on the front or back panel of the bag. You can choose from a wide range of colors, to find the one that best complements your company's personality. This is an affordable solution to order custom Recycled Woven Tote Bags your customers will love—at a competitive price.